In Ho Chi Minh City nowadays, being roughly considered riverside is already enough for real estates to be listed at insane prices. But in reality, despite the great number of water bodies intertwining throughout the city, there are many waterfronts being left barren and suffering from landslides. The legal framework for the management and use of lands encircled by rivers and canals has already been established by HCMC People's Committee, formerly in Decision 150 of 2004 and Decision 22 of 2017. However, investors who “dare” touch these areas, even with charitable intentions, would find themselves facing sensitive and complicated issues. 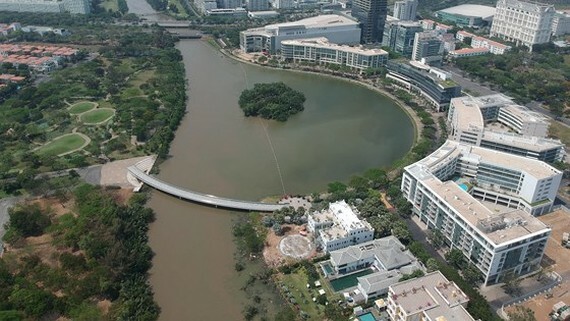 When Tai Nguyen Real Estate Company was in charge of constructions in the Saigon South New Urban Area, they asked for permission to build protective embankments and roads for public safety as the river bank was being eroded. They could not get a quick and easy approval though, since authorities easily saw their proposal as a way to exploit riverside lands, according to Mr. Vu Anh Tam, the company’s Director. He also stated that the project did cost his company a significant amount. Meanwhile, as highbrow as Phu My Hung Urban Area is, the contractors simply placed stones and called it embankments. They only planted trees and grassed the territories intended to be sold as land for real estates, and leave the rest of the area still covered with shrubs. Among these instances, one example stood out in both its unprecedented scale and money lost. Thao Dien Sapphire residential area (TDS, Thao Dien Ward, District 2) was a project invested in by TDS Joint Stock Company with an area of 27,018.4 square meters, which was consigned to them from the contractor GS Company. According to the Certificate of Land Use Right granted by the Department of Natural Resources and Environment of Ho Chi Minh City to GS Company, the investor was allowed to build major architectures in the remaining 56.4% deemed residential land, including multiple 3-storey riverside villas. In early 2016, TDS Company requested to borrow parts of the protective land embanking Saigon River to set up temporary structures for Thao Dien Sapphire project. However, before the Department of Planning and Architecture had a chance to consider their proposal, the investor proceeded to build a series of unpermitted structures such as swimming pool and sport facilities on the embanking territory. The local inspection agency of District 2 filed the first report of administrative violation against TDS in March 2017, but the owner did not comply and continued with constructions, which resulted in another report and request to terminate constructions. In May 2017, Ho Chi Minh City People's Committee issued an administrative sanctioning decision with a fine of VND1 billion, forcing TDS Company to dismantle unauthorized constructions that had covered a total area of 1,396.64 square meters. 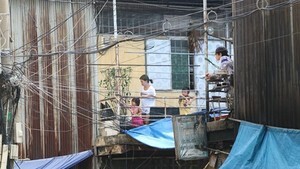 Then, in July 2017, Ho Chi Minh City People's Committee issued an enforcement decision following the administrative sanctioning decision mentioned above. Recently, it is known that the investor had demolished 14 unlicensed swimming pools and other entertainment assets on the Saigon river embankment, stated Mr. Huynh Thanh Khiet, Vice Chairman of District 2 People's Committee. Although there were controversies at the time, the government ensured that every contractor has to oblige to national law. It is necessary to amend and supplement the Land Law to state that real estate contractors are responsible for investing in protection embankments and public roads alongside water bodies, as well as entitled to use the land according to regulations of competent agencies. There should be also policies to aid investors of projects that were assigned before such amendments, or appeal to new investors to bid on the project. Publicizing plans on zoning and using riverside land is fundamental for preventing skyscrapers from hogging up too much space, or turning a part of Saigon river bank into housing-exclusive areas. As stated by Ho Chi Minh City Real Estate Association, Ho Chi Minh City is a riverside and coastal city, a highlight of which is the Saigon River and canals. This is an extremely valuable asset which contributes to socio-economic development, attracting domestic and international tourists. According to architect Ngo Viet Nam Son, roads along canals can be turned into walking streets or commercial services to attract socialized capital.